It’s the same every winter in the Piedmont. 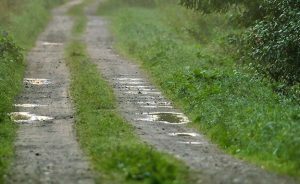 The snow, ice, rain, and fluctuating freezing temperatures wreak havoc on our rural gravel farm roads and driveways. And the spring ritual is always the same: figuring out how to fix the huge potholes that have emerged with the warmer weather to make traveling up the road less of a harrowing experience. Every winter, like metastasizing tumors, the potholes would appear. First one, then it would spawn another, and another, until there was a line of teeth-rattling holes in my driveway. I have a half-mile drive and the pothole devil chose three areas to infiltrate, each about a hundred yards long, creating plate-sized holes that turned the sections into washboards causing the car to jitterbug down the road. Potholes are invidious creations of Mother Nature, filling with water and for each car tire that drops in, the hole tosses out gravel and digs itself deeper. As if that wasn’t enough, with each warm day the top inch of the driveway would melt and turn to mush and with the ground underneath frozen solid, the mush would rut under the tires and create long gooey channels that often caused the car to slalom. So you’d be slip-sliding along until you hit pothole city when the rattling would shake your eyeglasses off. The double trouble drove me crazy, causing me to bang on the steering wheel and swear my head off. Anybody riding with me would look at me with alarm, obviously thinking I should start seeing a professional of some sort. Being cheap at heart, I first attacked the pockmarks with a wrecking bar, knocking down the edges to make the holes shallower. It was tough work and I felt like I was in a chain gang and should be wearing black-and-white-striped pajamas. The rehabilitated potholes stayed inactive long enough to make me feel victorious but, like guerillas sneaking out of the jungle, they soon reappeared, making me feel stupid for having spent six hours whacking at them with my wrecking bar. My backup tactic was ordering recycled building material and having it spread over the sections where the potholes lived. It was golf ball-sized stuff, teeth-rattling itself, but for a while it put the potholes to sleep. But not for long: one good rain and a couple car trips and the potholes would begin to reappear. Now, I guess a more even-tempered soul would have taken the reemergence of the potholes in stride, but I’d spent over a grand for the golf balls and I was pissed. To coin a phrase, it was like throwing money down a pothole. Until I happened to talk with my friend Bruce who introduced me to his secret weapon, a guy named Wesley who has special equipment, including a skid steer, a steamroller, and all kinds of special grading gizmos. So I got with Wesley and he gave me the lowdown. “This recycled stuff just sits on top and lets the water run through. What you need is crusher run with lots of dust, you put enough on so you can crown it, roll it down good and the water will run right off,” he explained. As I was at the end of my rope, though I winced at his numbers, I knew I had to step up. One Tuesday, Wesley attacked, invading my farm with huge trucks carrying loads of crusher run and spreading it evenly over the road. Smoothing it out with his skid steer and crowning it slightly, he then compacted it so if looked like the surface of Interstate 64. Driving it is nothing short of rural ecstasy: no more dodging potholes, no more shaking your fillings out, no more skating on a gushy surface, just an asphalt-smooth ride. No longer did I have to envy my friends with paved driveways, now I had one of my own, but with gravel! Not stopping there, Wesley deepened the ditches along the road, even creating new ones where needed to keep water from washing the gravel away. My driveway was getting a complete makeover, like sending my road to Charlottesville Skin and Laser. No more pockmarks, nasty wrinkles or age lines, my road had the ultimate facelift. Sure, I was out a few bucks, but I was a happy camper for, finally, I had a real road.